Is Bridget an "enabler"? You know the term that Dom, and Martha herself, uses when referring to her support of his sidecar addiction. And I think that addiction may be the correct term rather than "self-destructive behavior" in this Merriam-Webster definition. 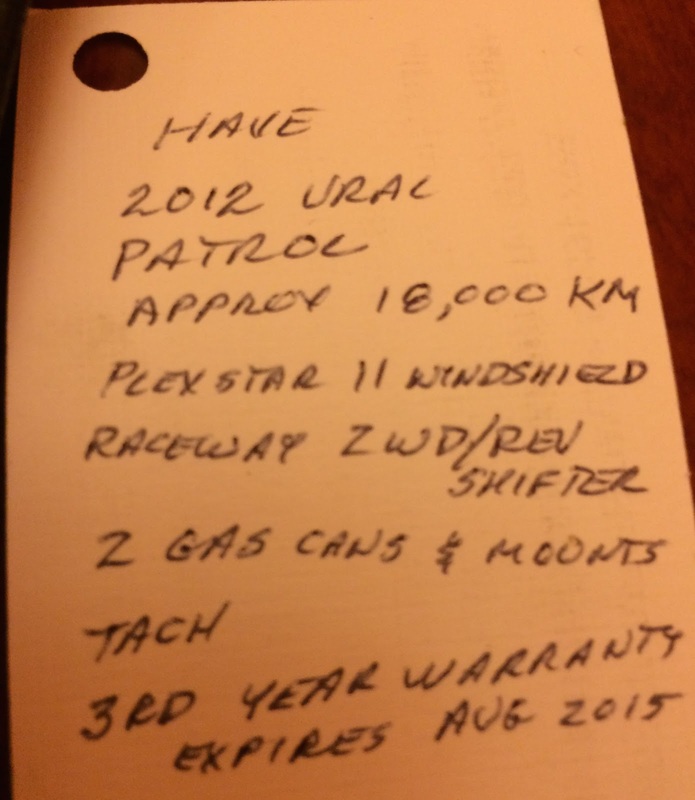 This evening, Bridget sent me a text message containing a photo of this note from someone in Fairbanks who has a Ural for sale. She ran into him (not literally) at a gas station while he was driving his other Ural. While they were talking about visiting Mickey, the Anchorage Ural dealer, he mentioned that he had another Ural that he was going to be selling. You have to love the fact we've enabling wives RichardM! Go see it, test drive it....you'll know if its a good rig or not. Post pics, as the note didn't mention color scheme. Of course, if I was the seller, I'd keep it as a "spare" sidecar but that's just me. Waiting patiently to see how this turns out. It was great to see you last week, we both really enjoyed the visit. Is it enabling or just seeing the one you love want to be happy? Win/win for you either way. Maybe she just wants to ride with you more. "Enabling" was a term I picked up from Dom. Well, you and Dom seem to have been very smart in your choice of women. Way to go Bridget! She knows what the man want (needs?). I don't think that there is a lot of interest in riding in the sidecar though it is apparantly way more comfortable than the Cozy. The way I see it is Bridget is enabling you to get the Ural, "win/win". We'll see what happens. Running into something locally seems to be pretty good luck. Though I'm not sure of the status of the local dealer. I haven't made it out to his new shop yet. Today I get a call from the CU about a loan.....that's how I find out Richard is serious. I sent him the info, he called the guy and the CU without letting me know he was that interested. I need to read his blog to know what is going on. So, since I found it, it should be mine, right? It is blue, and my car is blue, so it should be mine, right? I will just let him drive it because of my fear of motorcycle driving. After riding in Mickey's Ural in Anchorage I would love Richard to have a Ural. It is world's better than whatever he has now. Enable? He enables me, too. Richard is a great cook, and cleans the kitchen when he is done! He lets me travel. He even let me get 2 dogs. He could leave the other one in Corvallis, but I don't know if he would like to drive it down. We could haul it down on a trailer, but then people would make funny comments on the highway. So, nothing wrong with hauling one's sidecar rig on the boring superslab segments.....I've come late to this realization but there you go. Had to chuckle Bridget that you find out about Richard's plans on his blog. My wife has expressed those same words more than once.